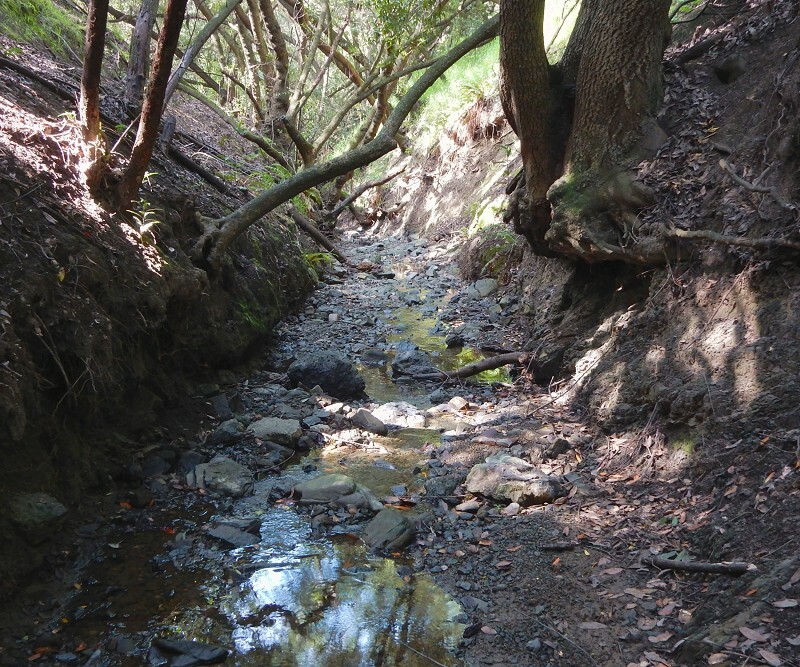 Two weeks ago I wrote about the upper part of Arroyo Viejo, in Knowland Park, and said that I hadn’t walked the whole section exposed along the stream. Soon afterward I returned there and did the deed. I had a special goal of locating fossils in the Knoxville Formation. This time, instead of following deer trails along the hillside, I went up the streambed, starting at the conglomerate outcrop I showed in that post. This is a closeup. It was pretty easy going for the most part. 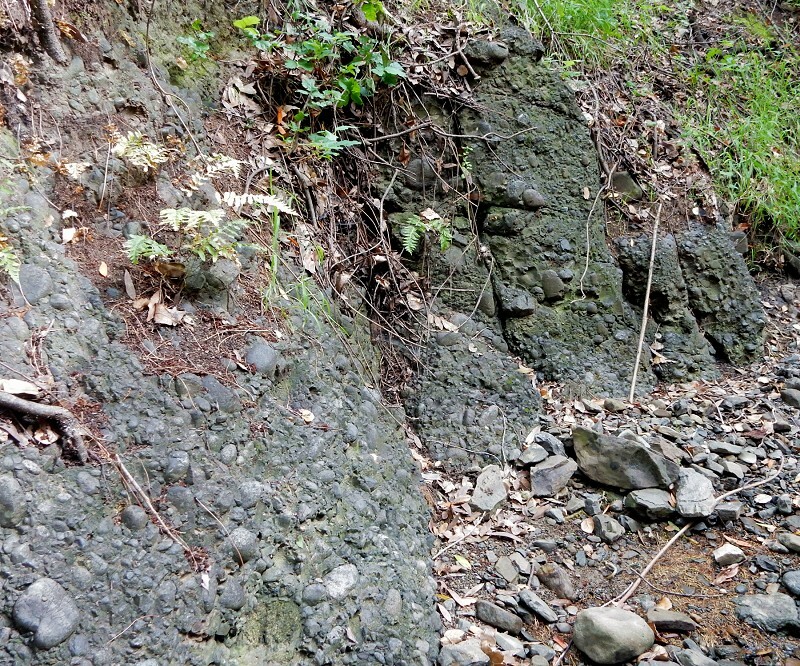 There have been no recent landslides into the creek, and in general you can see that the creek has been cutting down leaving tree roots–and bedrock–exposed. Most Oakland creeks aren’t this vigorous. 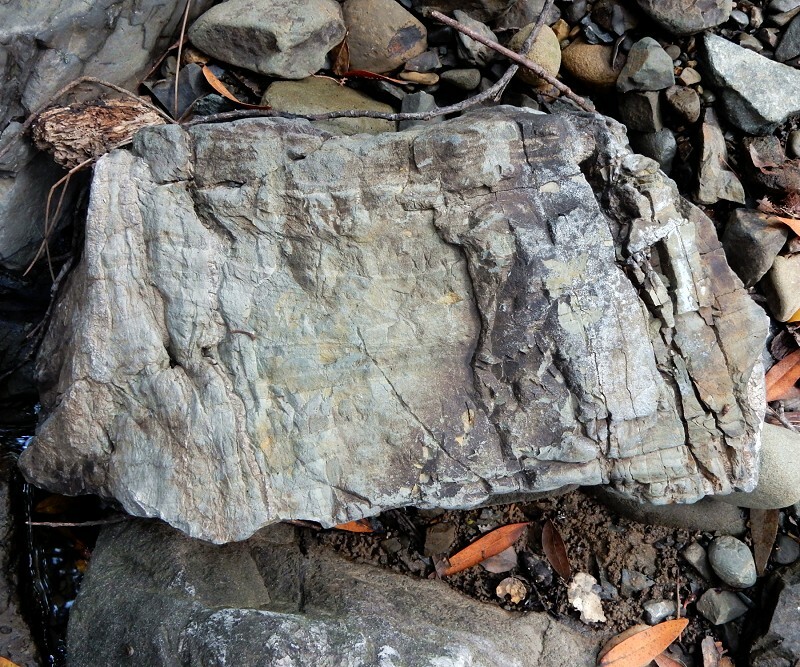 Most of the section is coarse-grained rocks, sandstone and conglomerate. Here’s an outcrop that exposes conglomerate on the left and sandstone on the right, all steeply tilted. Researchers from both the US Geological Survey and UC Berkeley have found and collected fossils near here. (In fact I think they were all the same person, Jim Case, who did his Ph.D. work here in the early 1960s and then expanded it for the USGS in Bulletin 1251-J.) Many rocks have microfossils in them, which are useful for experts but not very thrilling for the average amateur geologist. What caught my interest was that these were macrofossils, the remains of regular everyday-sized organisms. To find macrofossils, you want shale. There were chunks of it in the streambed, but outcrops were scarce. The fossils were reported as being shellfish of the genus Buchia and unspecified belemnites. Buchia was a group of chunky, oblong bivalves much like clams that lived during Jurassic and Cretaceous time. Belemnites were squidlike creatures with internal shells that lived around the same time. You’ll see polished specimens in any rock shop. I didn’t come prepared for fossil hunting, with the right hammers and chisels and so forth; I just wanted to see if I could spot some on the ground. Rocks like this, I gave a searching inspection. 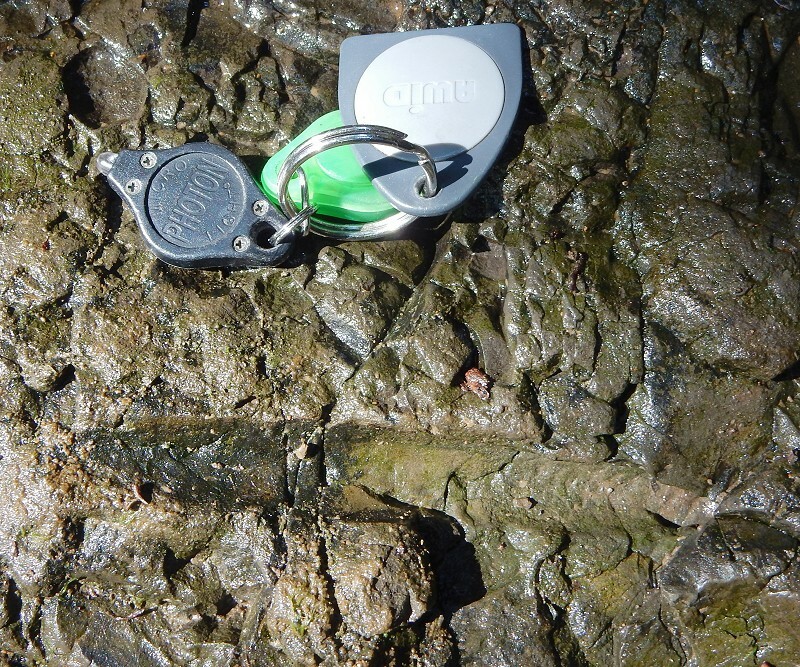 Then, there it was in the middle of the streambed–a belemnite mold. A mold is the space that once held a fossil. Here the stream managed to dissolve the calcite shell and pluck it out of the rock. So this isn’t much of a fossil, and belemnites aren’t useful for zeroing in on the age of a rock the way Buchia is, either. But it’s proof of concept. I was as thrilled as when I was a kid grubbing brachiopods out of the Devonian shales of upstate New York, once upon a time. 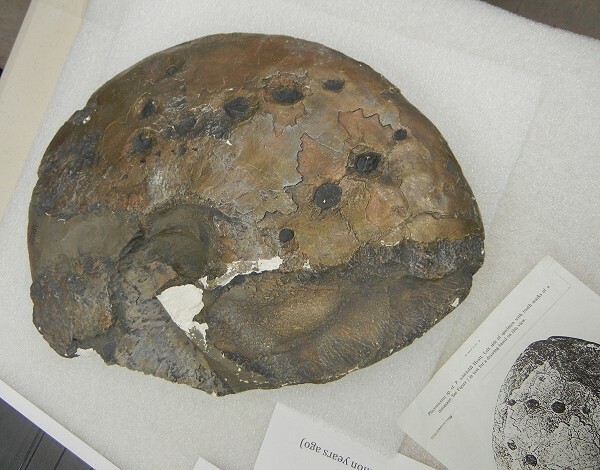 Last month, as part of Cal Day, they were giving backstage tours at the UC Museum of Paleontology. The day is a mob scene, but on the last tour of the afternoon I had a fine time being shown around by two of the museum’s scientists. The collection is vast, the world’s largest university collection. Only part of it is in the Valley Life Science building. There’s also a building in Richmond, and there are great accumulations of tar-seep fossils (from La Brea and McKittrick) housed in Sather Towerthe Campanilebecause they smelled too much to keep with the others. The collection at Valley Life Sciences is housed in huge cabinets that slide along tracks to open enough space to pull out the drawers. 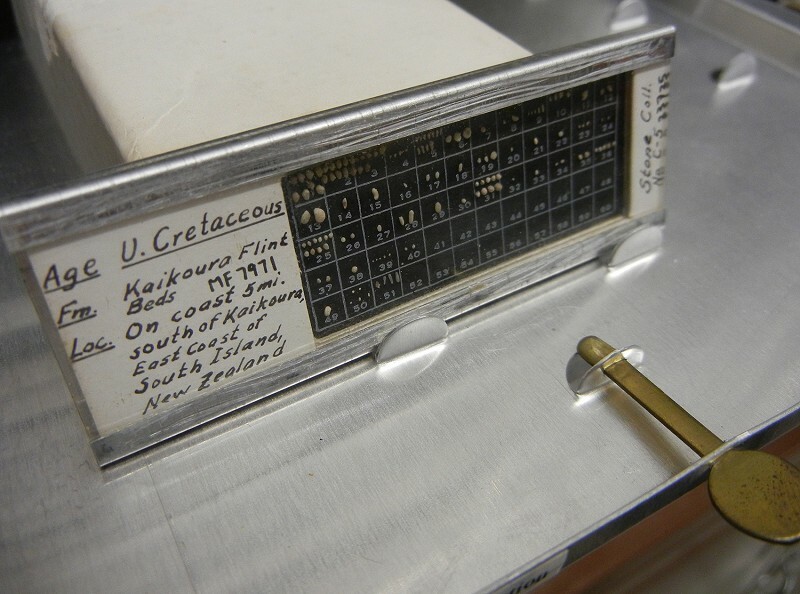 Many of those drawers are full of microfossils. These are a huge part of California’s heritage. It was a thorough knowledge of microfossils in the rocks of the Central Valley and Southern California that informed and guided our petroleum industry. California remains America’s fourth-largest oil and gas producing state thanks to this scientific-industrial heritage. But naturally, the museum had some of their photogenic specimens out. 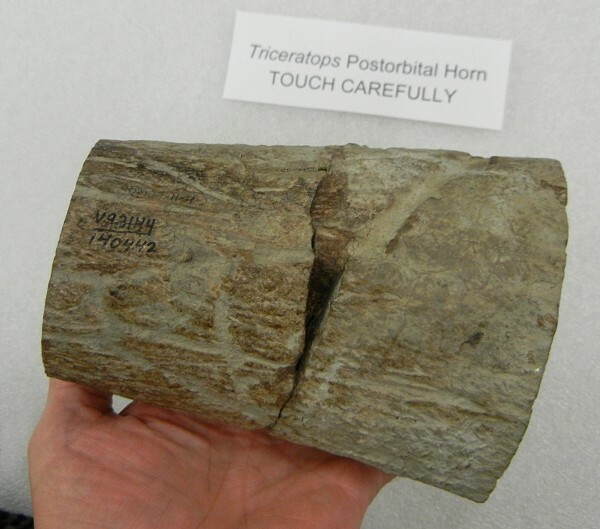 This Triceratops horn, with slices sawn off to expose its interior, was a privilege to hold. Unfortunately, the Bay area has no dinosaur fossils at all, although a few marine vertebrates from Mesozoic times have been found. This ammonoid shell was interesting because it has a beautiful set of tooth marks on it, courtesy of a mosasaur. In the corner of the photo is a drawing of the specimen, as published in a scholarly paper. Mosasaur fossils, to my knowledge, are not known from California either. Not yet, anyway. And this thing sitting on the floor gave me joy. 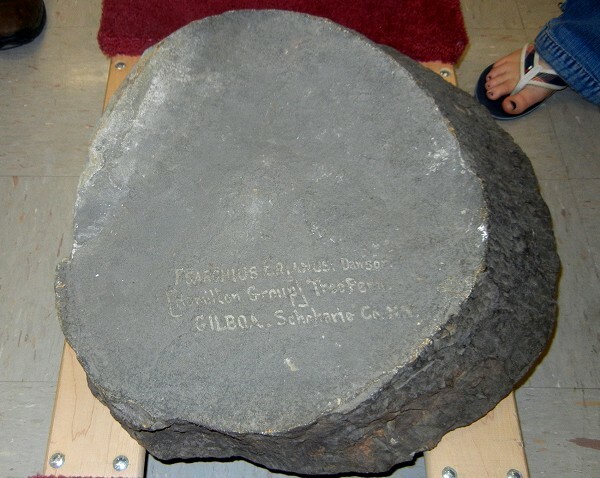 It’s a stump from the world’s first forest, dug up in rocks of Middle Devonian age in upstate New York. The inscription reads, “Psaronius Erianus Dawson / [Hamilton Group] Tree Fern / GILBOA, Schoharie Co. NY.” The Gilboa forest was first excavated in the 1870s. When I was on About.com, I featured Gilboa in my list of geo-attractions of New York state, and I hope you’ll seek it out if you’re ever there. This specimen was undoubtedly part of an exchange of fossils between UC Berkeley and the State Museum of New York, a traditional way for paleontologists to enrich each other’s collections. It was surely a source of pride for Joseph Le Conte, the geologist who was the University of California’s first president. His fossil collection was the nucleus of today’s museum. 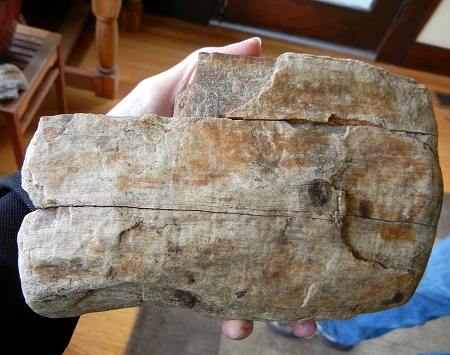 I was lucky enough to examine this large specimen of fossil wood that I was told came from the hills of San Leandro. People have told me about and showed me pieces of fossil wood from the East Bay hills before. I’m no expert on the subject, and I haven’t done a lot of fossil hunting in Oakland. 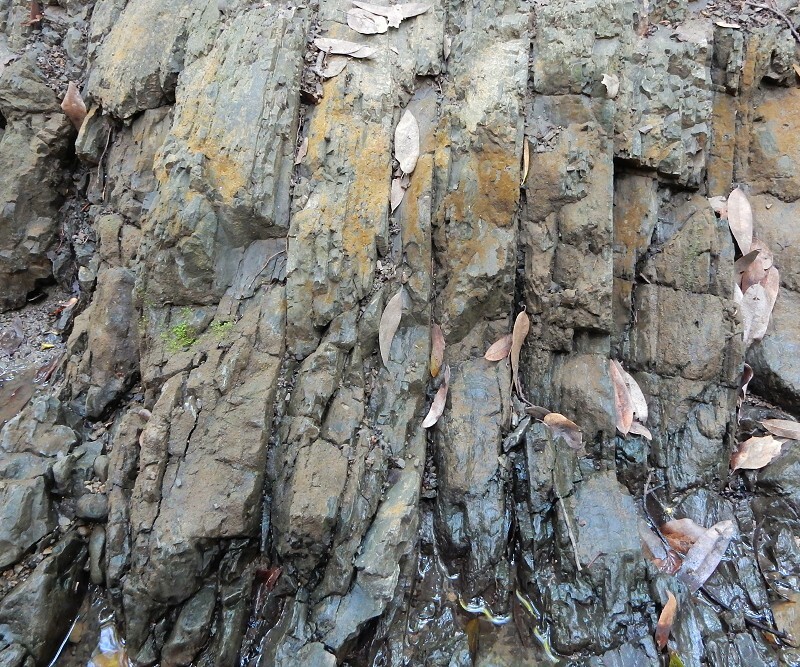 But we have young terrestrial rocks around here in addition to the abundant marine rocksprimarily the Orinda Formation, of Miocene age. I assume this came from there. People have told me about fossil wood in Wildcat Canyon, but that’s regional park land where collecting is forbidden. This specimen, I was told, was from EBMUD land, where collecting is not expressly forbidden, although I assume that vertebrate fossils (animal bones) are protected. I have purchased an EBMUD permit and have been looking forward to using it for responsible geologizing. If you’re at UC Berkeley with a little time to spare, go visit the Valley Life Sciences building and say hi to the sabertooth cat fossil there. Smilodon californicus is our official state fossil. It got the honor from its abundance in the tar pits of Rancho La Brea down in Los Angeles. It turns out that they were suckers, walking into the tar to feed on animals already stuck there, then getting trapped themselves. 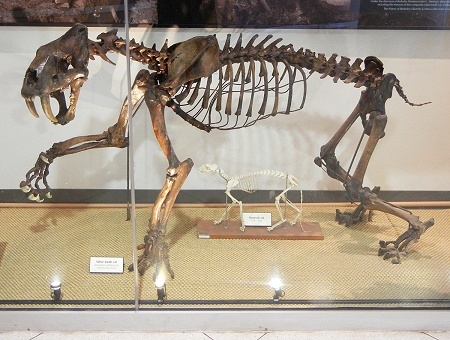 They and the extinct dire wolf are the two most common species in the tar pits. Presumably they lived in Oakland, but I don’t see any reference to local Smilodon fossils. One of the things on my to-do list is to visit the paleo people at UC Berkeley and learn more.